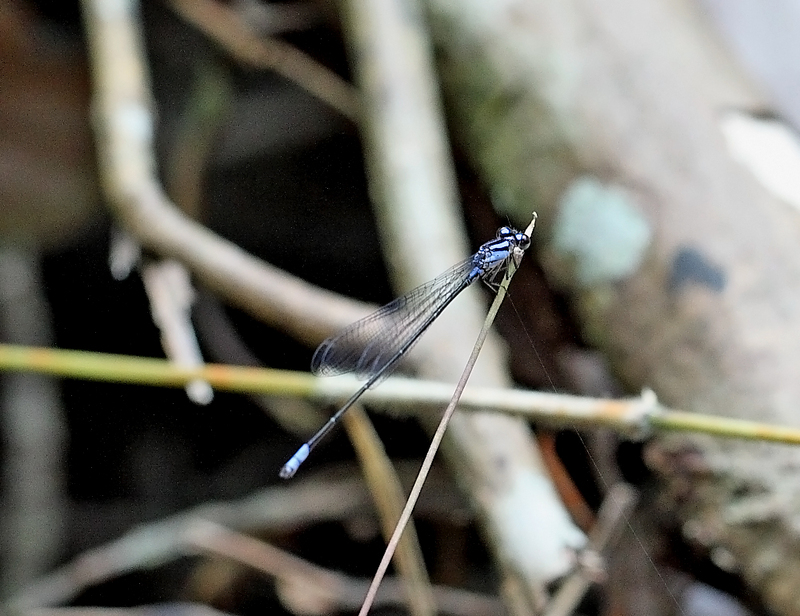 Mortonagrion arthuri is a locally rare species of damselfly which is confined to mangrove habitats around Singapore, particularly Pulau Ubin, Pulau Semakau and Sungei Cina. Their natural habitats are inlets of mangrove swamps where they like to rest on the tip of an emergent twig of mangrove trees. Male has two color forms. Blue form and yellow form. The blue form has blue stripes on the side of the thorax and blue postocular spots; while the yellow form has similar features but in yellow. Male also has distinct blue spots on the segment 8 of it’s abdomen. 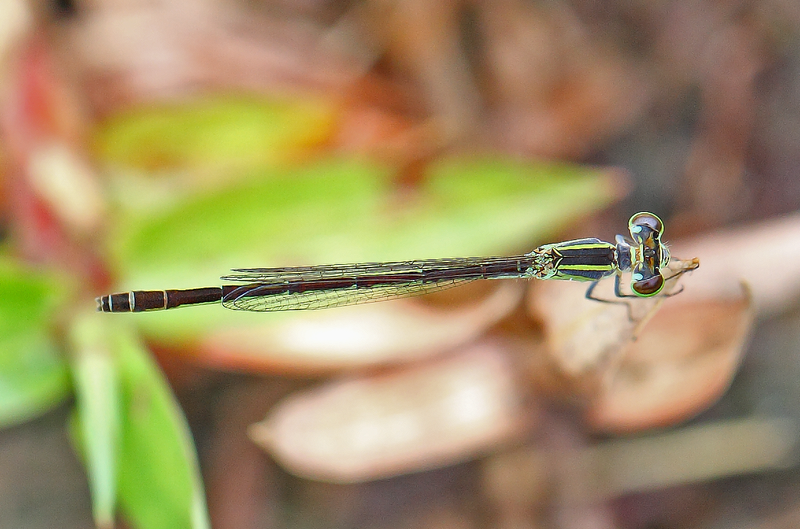 Females are duller in color. It has brown thorax with similar stripes to the male. Young female also has the distinct spots on it’s abdomen. Older female has the spots completely obscured. 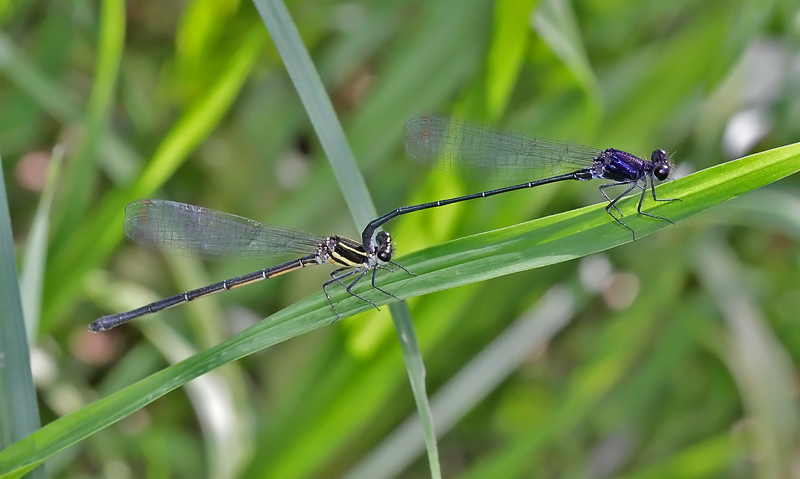 In general, males of mortonagrion arthuri are more rarer than females. 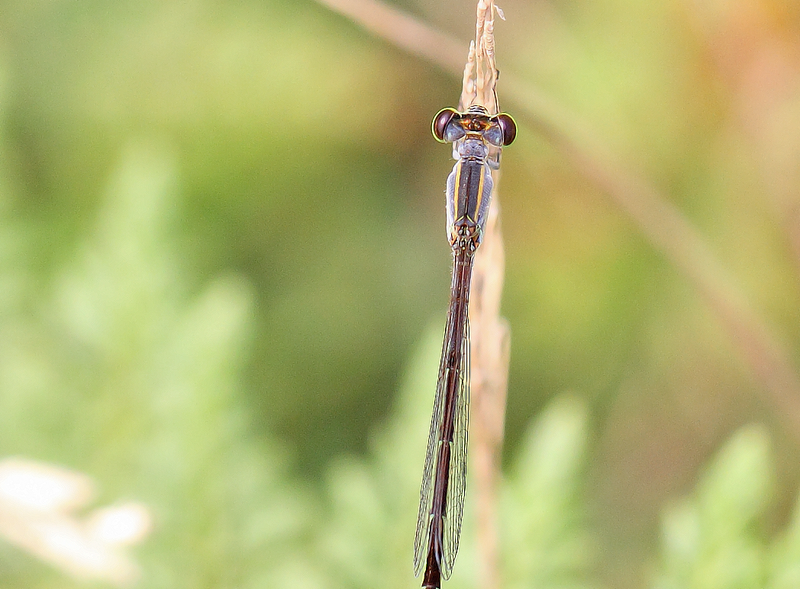 Female mortonagrion arthuri. Notice the blue stripes and blue spots on the abdomen. This specimen was found at Pulau Ubin. Another female at Pulau Ubin. This is a much older female where the abdomen is almost black with no visible spots on it’s abdomen. Another old female. The end of the abdomen are almost covered with earth. A sign of ovipositing on muddy soil. This female was found at Sungei cina. An old female with a muddy abdomen. Same female as above. This picture shows a brownish thorax with yellowish strips and postocular spots. An interesting view of the front which shows the dark brownish eyes and black face. Notice the “dracula-like” mouth!. Another female at sungei cina. This is a younger female with distinct blue spots at it’s abdomen. A lateral view of the above female. Males of this species are generally hard to find. I have seen a couple of females at Pulau Ubin but not a single male. 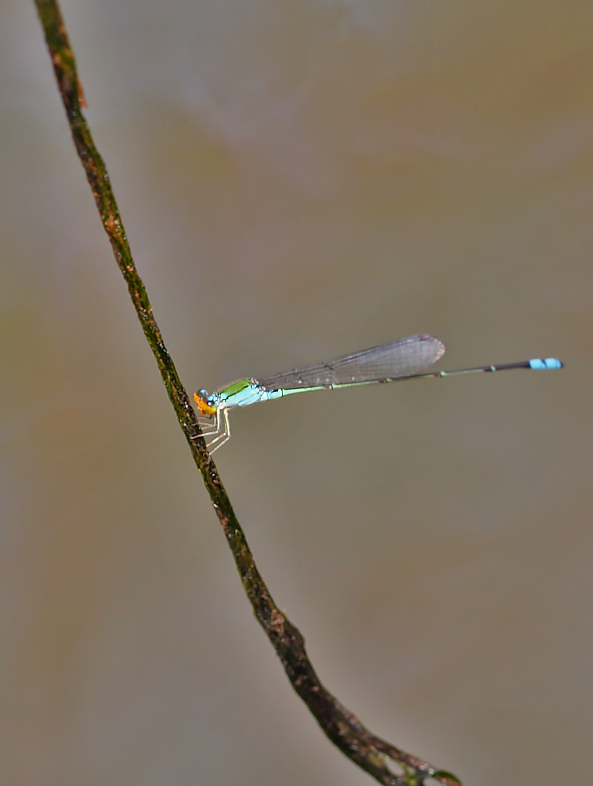 I have better luck at Sungei Cina, where I managed to captured a couple of males both in blue and yellow form. Male #1. Frontal shot showing the interesting facial features. Male #2. 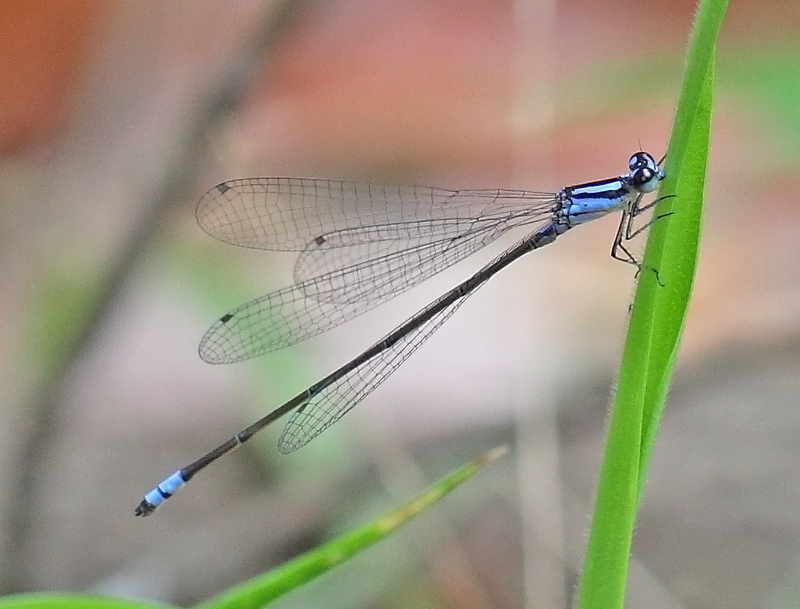 Young male, blue form. Male #2. Dorsal view. Notice the unique postocular eye spots, slim blue stripes and blue marks on the abdomen’s segment 8. Male #2. Appendages are black The superior appendages are shorter than the inferiors. Male #3, yellow form. taken against the swampy mangrove. Male #3. Lateral view. Notice the small spots at the side of the abdomen. Male #4 yellow form. Why is this specimen looks abit greenish in color? Male #4. yellowish / greenish male form. In Singapore, not many photos of this species has been available in the internet. 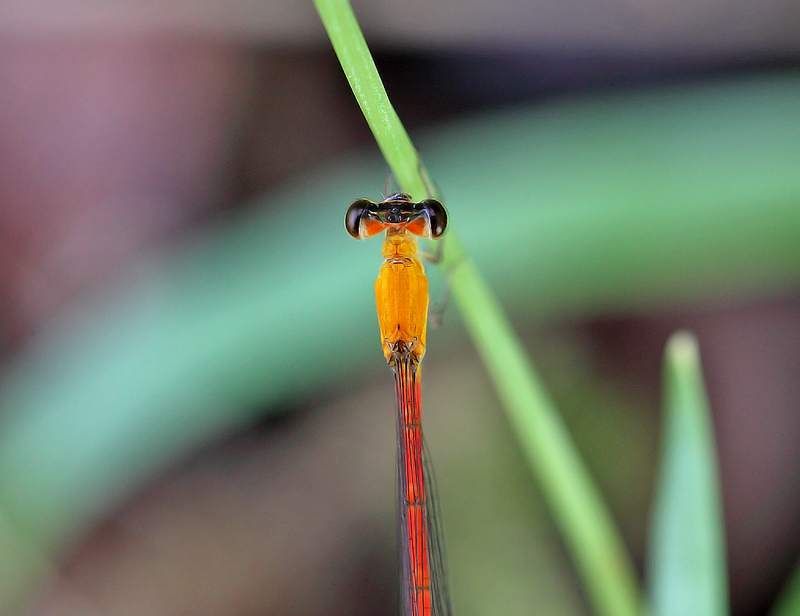 I hope these photos could add to the archive of the diversity of odonata found in Singapore’s natural environment. 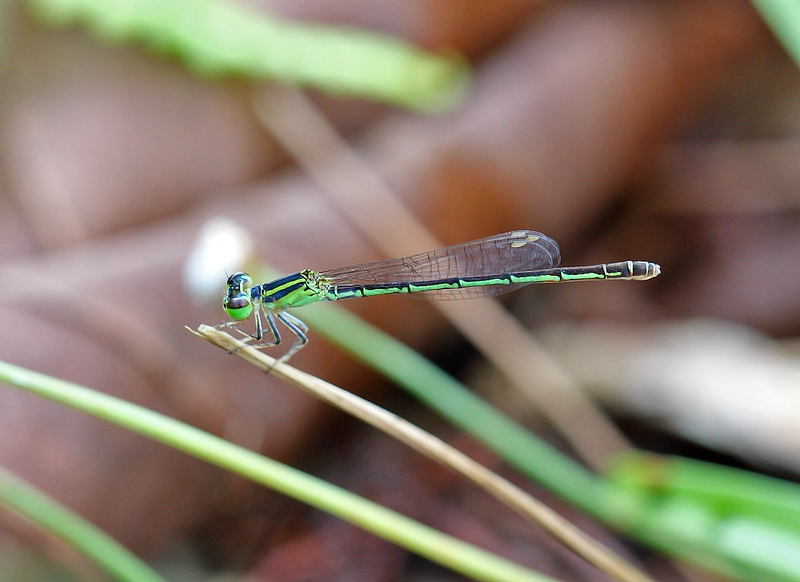 In this post, I would like to showcase a few species of dragonfly and damselfly which could only be found in the mangrove swamps around Singapore’s coastal regions. Areas which I had visited include Sungei Buloh Wetalnd Reserves, Pulau Ubin, and the mangrove swamps around the North Western part of Singapore. 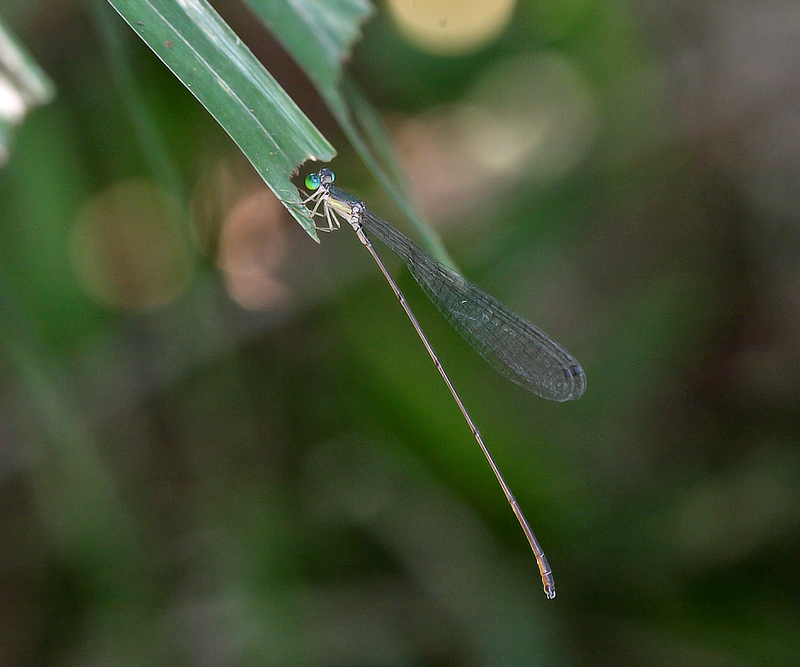 Some species are uncommon such as mangrove dwarf (Raphismia bispina) whilst others are rare, such as the elusive mangrove marshal (Pornothemis starrei) and Arthur’s Midget (Mortonagrion arthuri). 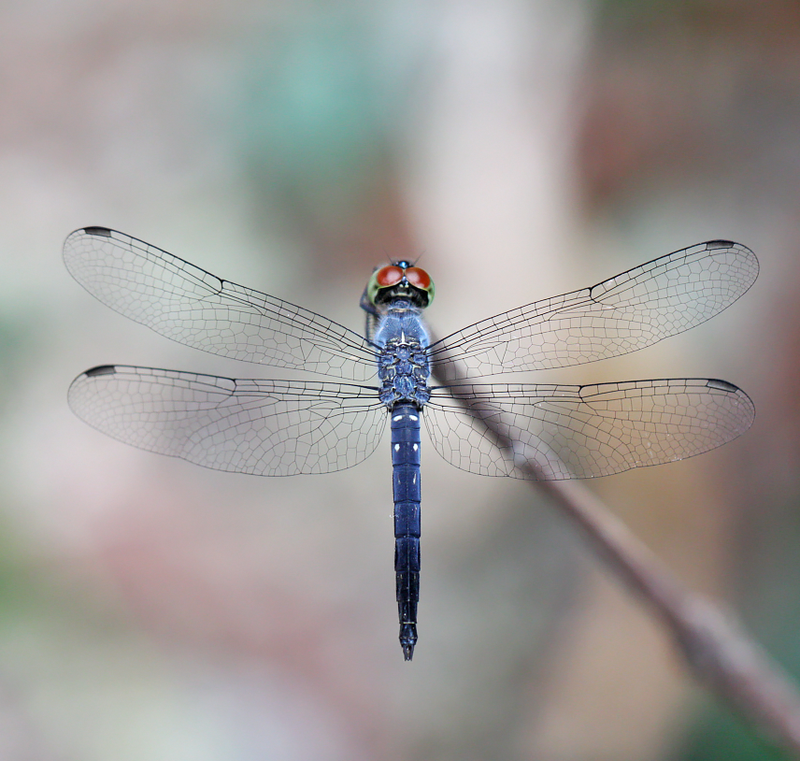 They are uncommon species and one of the few dragonfly species that lives and breeds in the salt water in mangrove swamps. I have seen and recorded this species at Pulau Ubin, SBWR, and Sungei Cina. Young female Raphisma bispina. It has clear wings. The eyes are brown on top and yellow below. It has mottled yellow marking at the side of it’s thorax and yellow streaks along the abdomen. An older female where the yellow markings at the side of the thorax and abdomen are obscured. A sub-adult male. The thorax is slated blue with some yellow streaks at the sides of the abdomen. 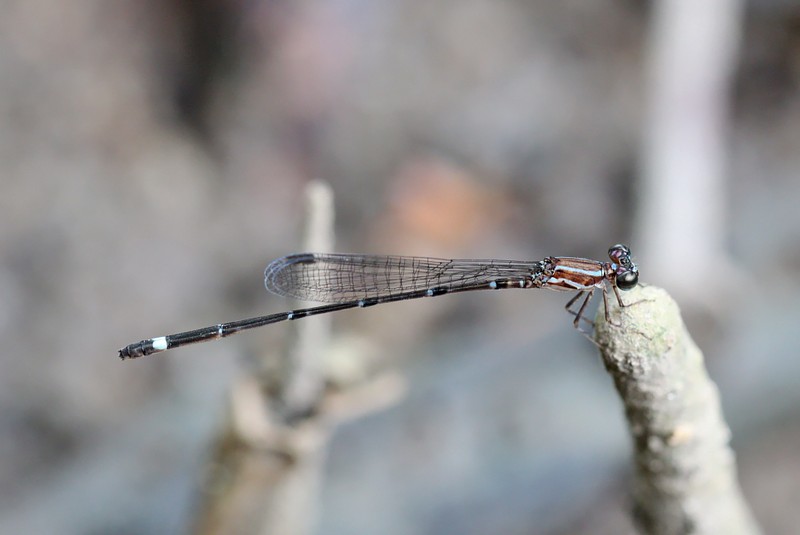 A female Mortonagrion arthuri resting at the tip of the root of mangrove tree. It has brown thorax with blue stripes. 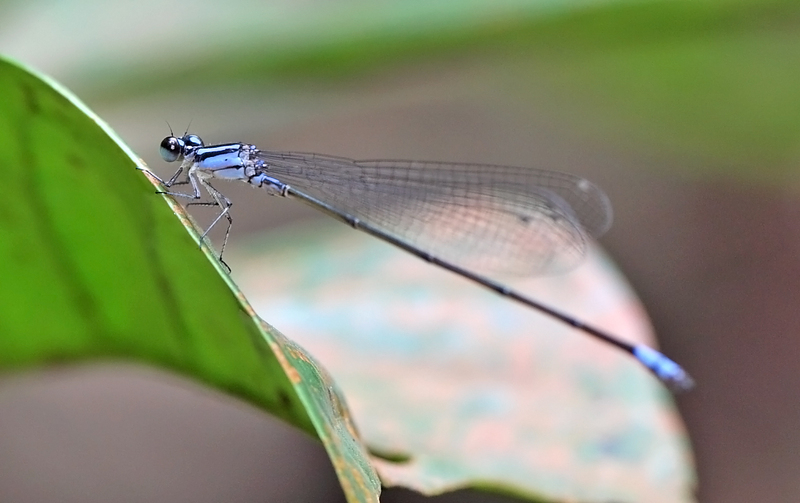 Similar to males, it also has distinct blue markings on segment 8 of the abdomen. This species is rare in Singapore. I have come across it once at SBWR and Pulau Ubin and a few occasions at sungei cina. 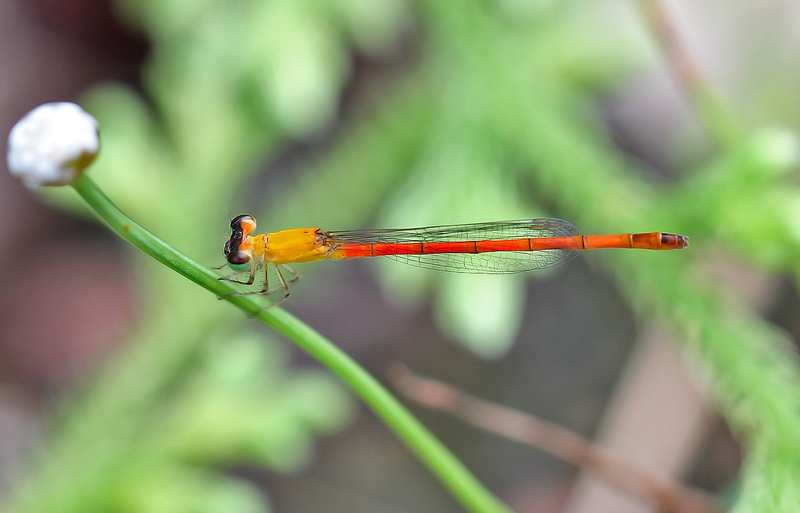 A male pornothemis starrei. It is slightly metallic black with white pruinescence on the dorsum of the thorax. 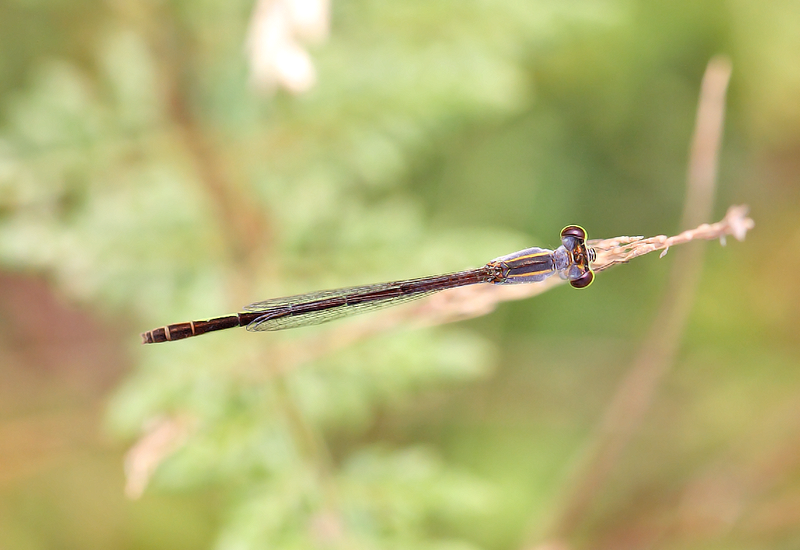 Mortonagrion arthuri is also a mangrove species and could be found at Pulau Ubin and Sungei Cina. An older female. The blue markings on the abdomen is already obscured and could not be seen. 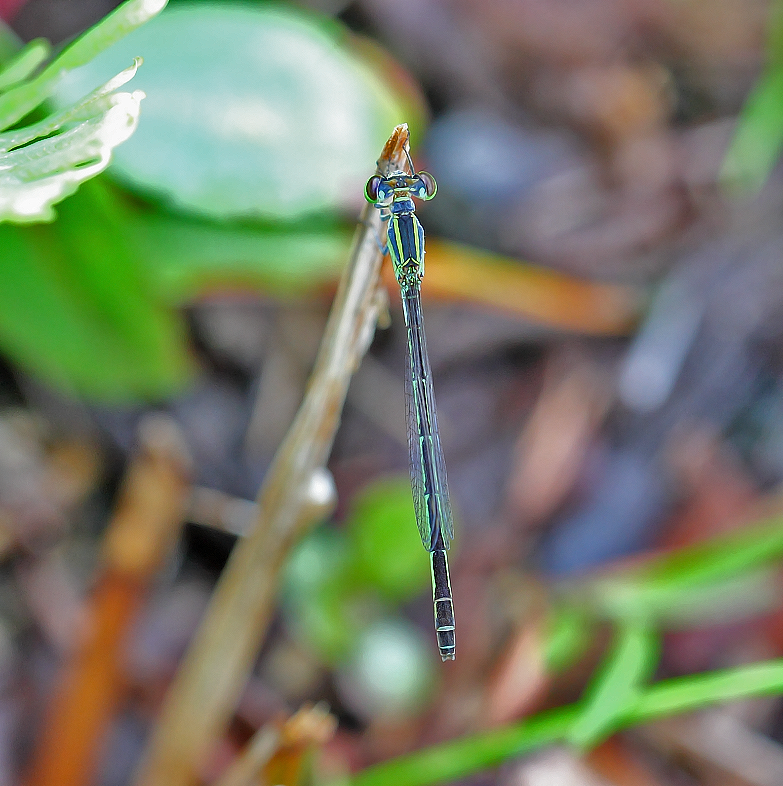 A male mortonagrion arthuri. Male has two colour forms. This is a bue form which it has blue stripes on the thorax and blue postocular spots. Notice the distinct blue markings at segment 8 of the abdomen. 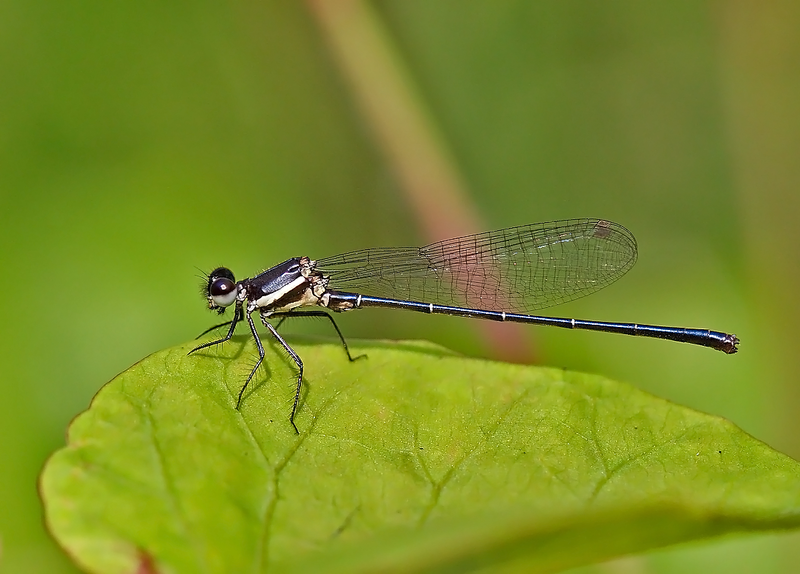 Although not exclusively associate with mangrove habitats, the following two species of dragonfly could also be found there. 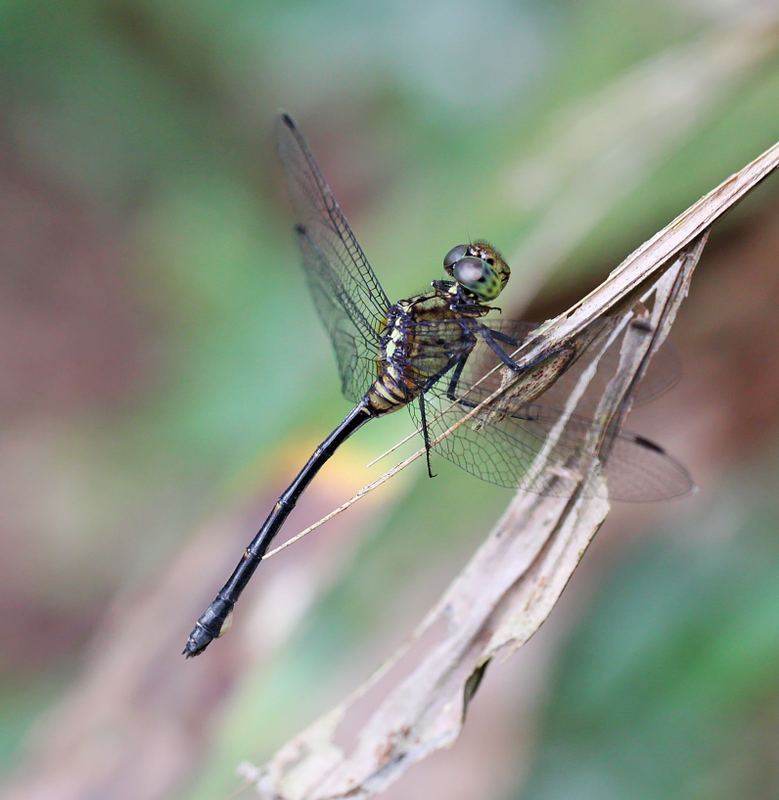 A male Orthetrum sabina ( Variegated green skimmer). A female Agrionoptera insignis (grenadier). It is important to preserve our limited mangrove habitats so the rare species of plants and animals could continue to thrive there. 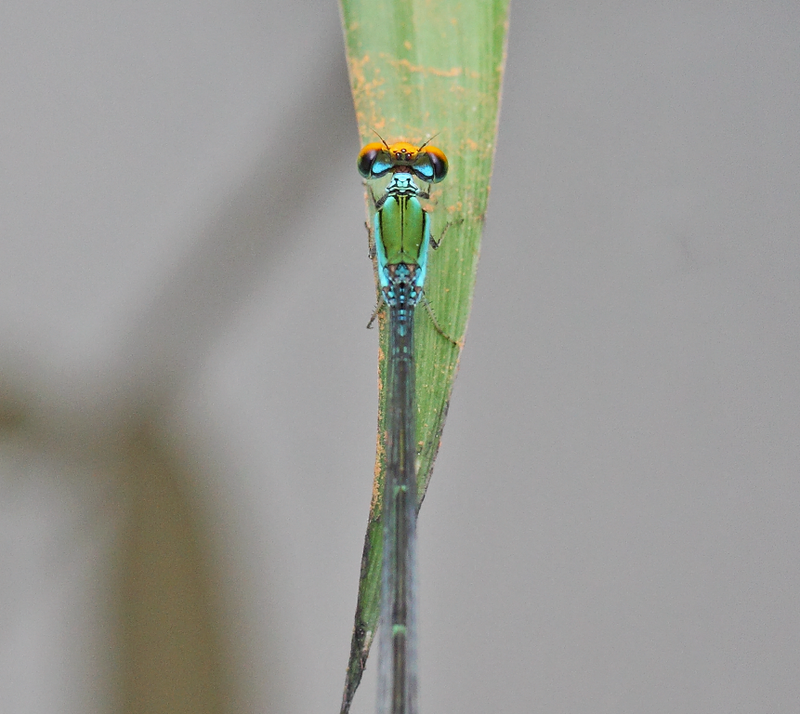 Aciagrion hisopa is a very rare and small damselfly which has rarely been encountered in Singapore. It’s habitats open shallow and weedy ponds and drains in disturbed areas. According to record, one female was found in Normanton Park in 1986. A pair was found at Chestnut Ave in 2009. There are no other records since then. 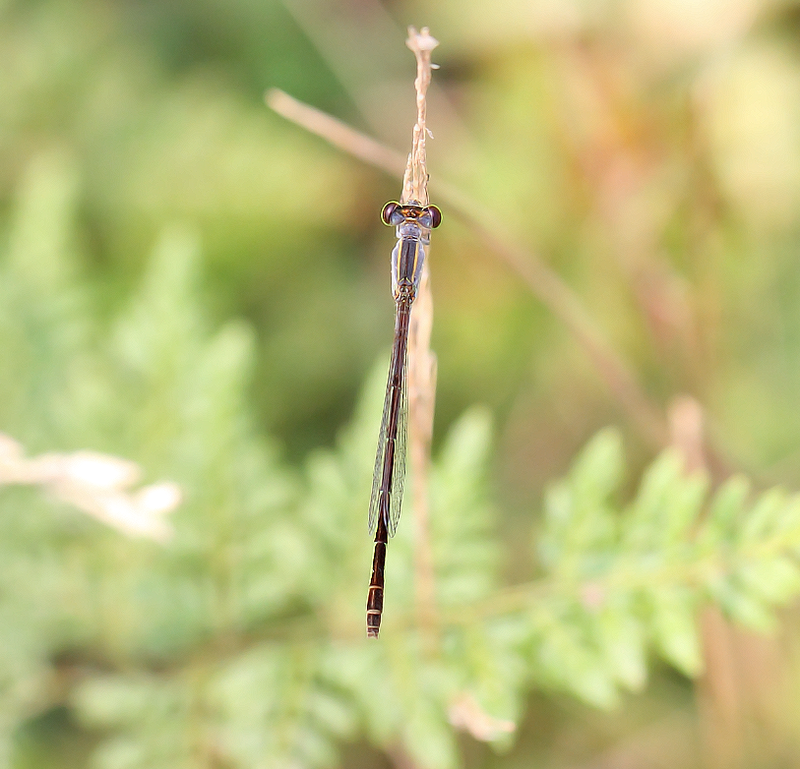 In May 2016, I was at the Central Nature Reserve and accidentally bumped into a Aciagrion hisopa, female in the bushes. The area was very remote and isolated, sparely forested and near to an open wetland. It was fluttering around the bushes looking for it’s meal. 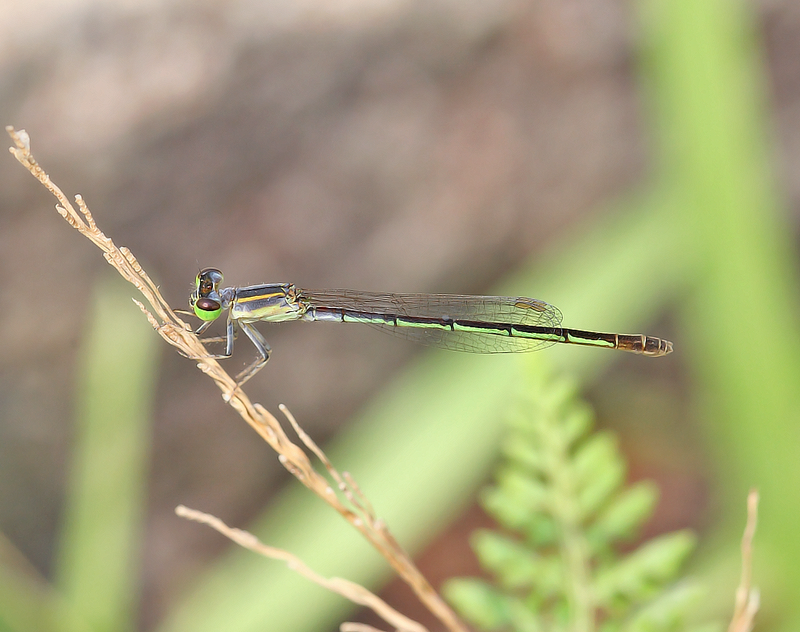 The damselfly was so small that it’s almost impossible to track it as it moves around the bushes. 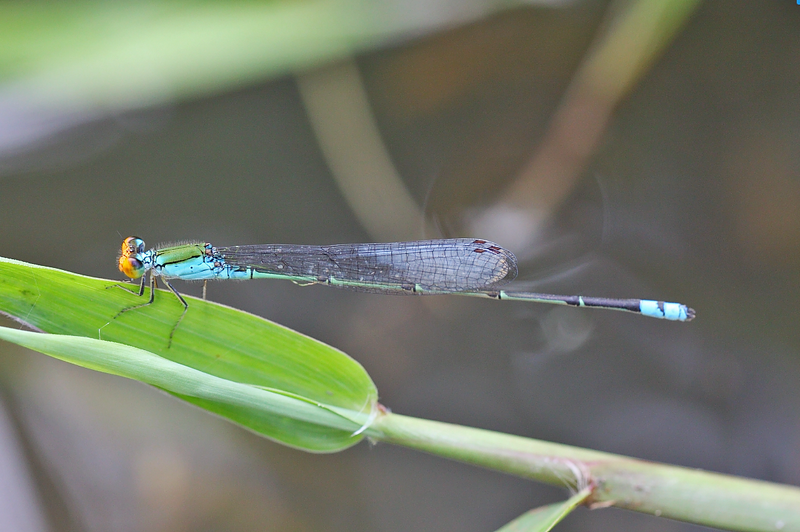 Aciaprion hisopa is very similar to Pseudagrion species, except that it has a lighter build and the wings are narrower. The spotted female has the sides of the thorax blue with distinctive black and orange stripes on the dorsum. The last three abdominal segments are blue. The eyes are green. 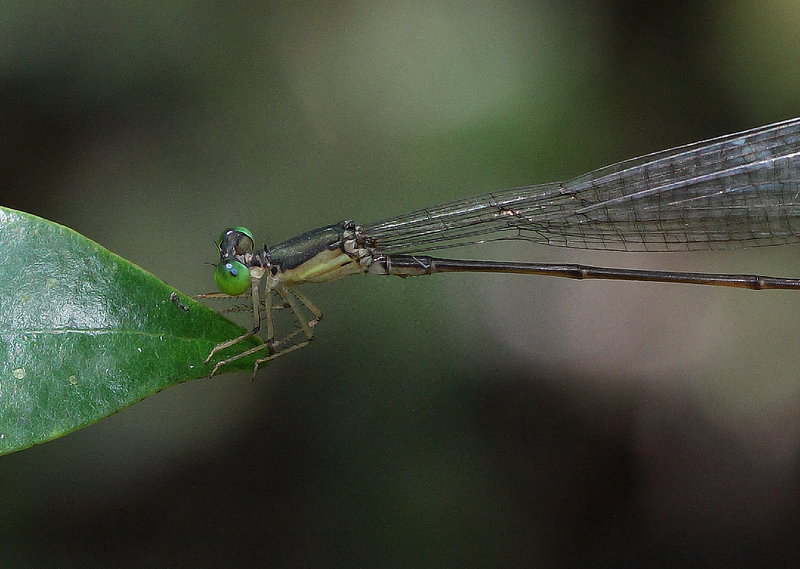 Here is the damselfly resting at the tip of the leaf inside the forest. 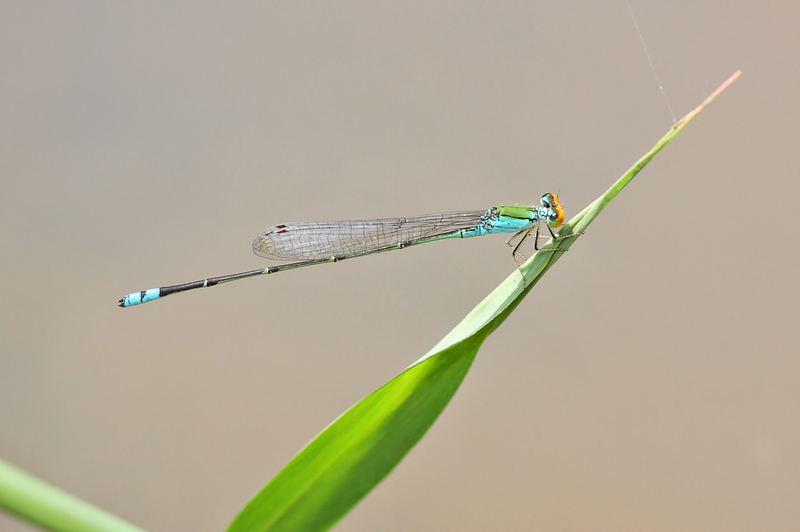 Just compare the size of the damselfly against the leaf it was resting on. Amazingly small. 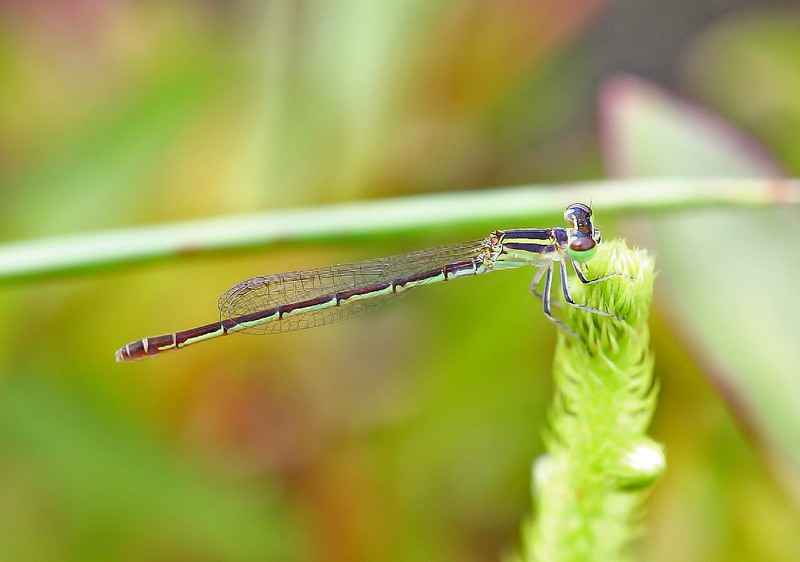 The tiny female Aciagrion hisopa. Although very rare, I believe this species can still be found in our vast forest reserves. 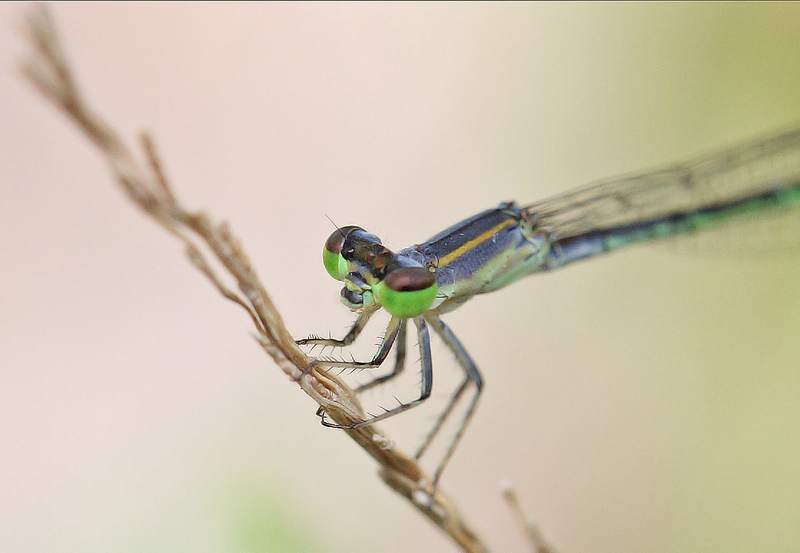 According to the book of dragonflies by Mr. Tang, this very rare damselfly has been found only at two locations in Singapore. 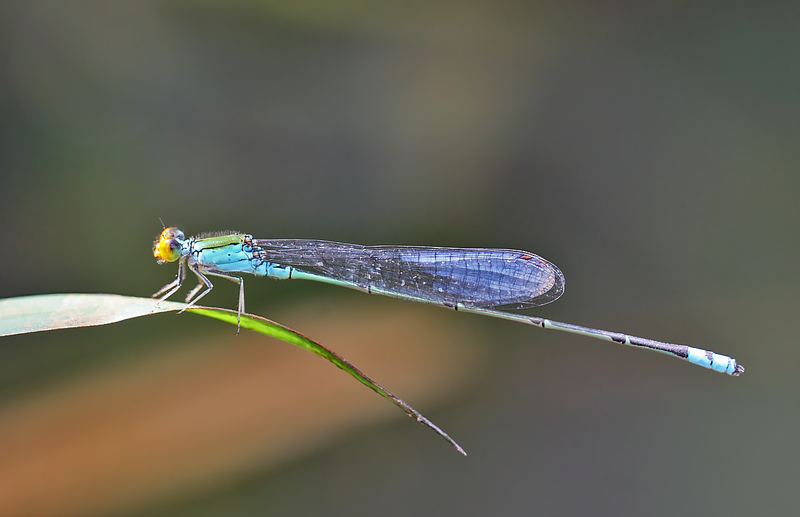 These sightings were at Toa Payoh Town Park, and at the Central Catchment Nature Reserve. My sighting of this species were at a very remote location at the western part of Singapore. The place has a small running stream surrounded by short and weedy vegetation. 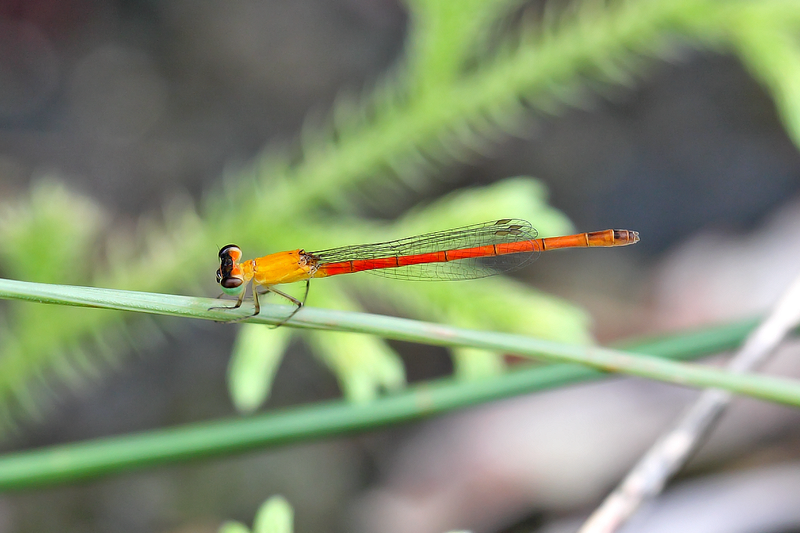 The male has a striking bright orange face with olive green on the dorsum. It has beautiful light blue on the sides of the synthorax and blue markings on segment 10. 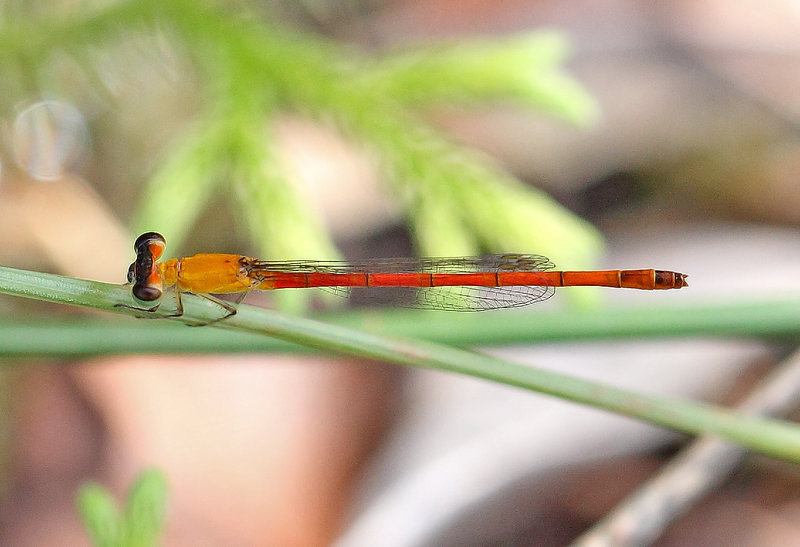 My very first “blurry” picture of this male orange-faced sprite. Do you see him? 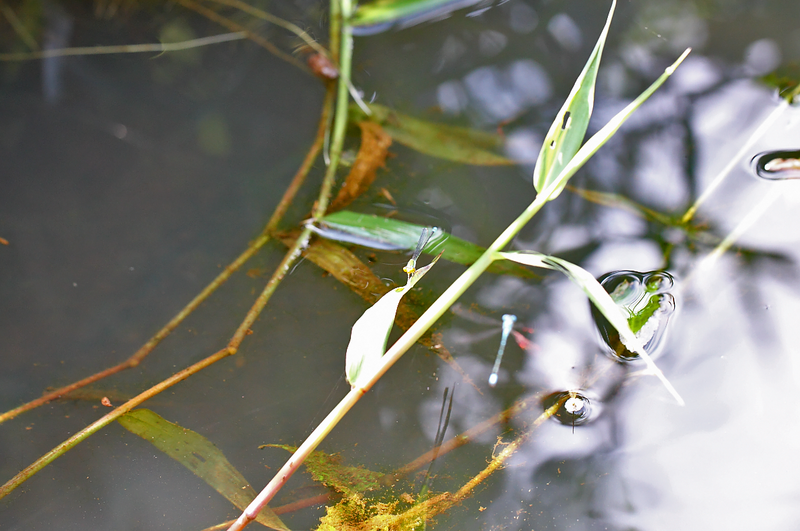 This picture shows the stream and vegetation where the damselfly was found. 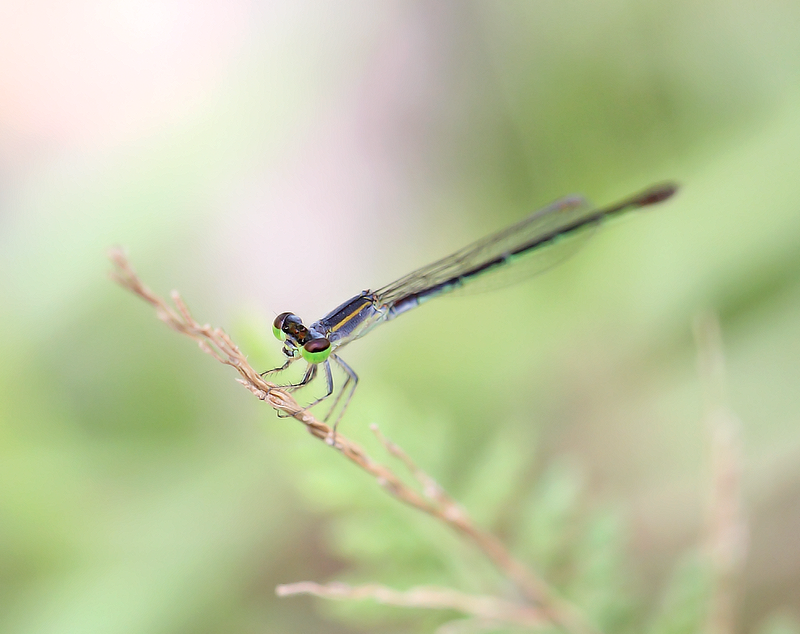 He landed on the long root of a plant near the stream. The orange-faced is very outstanding! A closer look at this species. It has beautiful combination of blue and green on it’s thorax. A ventral view of it’s synthorax. Notice the blue eyes spots. A lateral view of the male. The wings of this species is hyaline, but this individual has it’s wings tinted white. 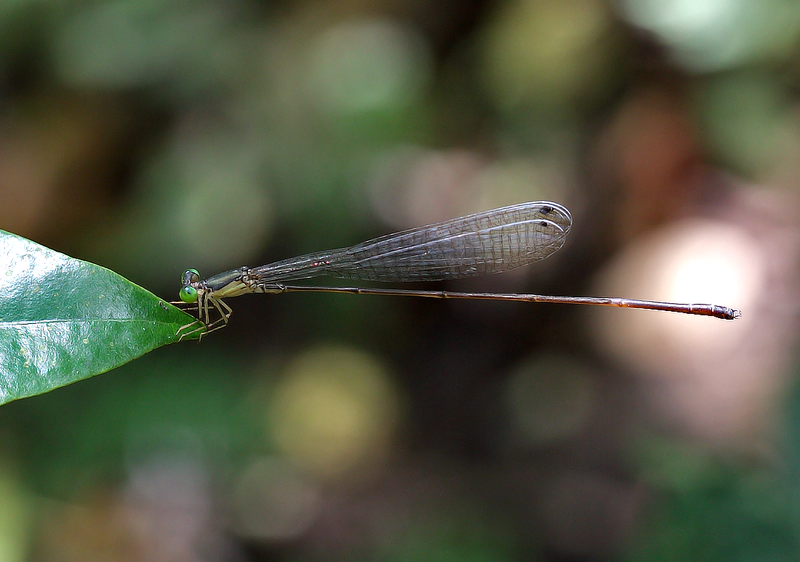 One of the most beautiful damselfly species I have encountered in Singapore. It is sad that this species can no longer be found at Toa Payoh Town Park, but elsewhere in Singapore, it can still be found. 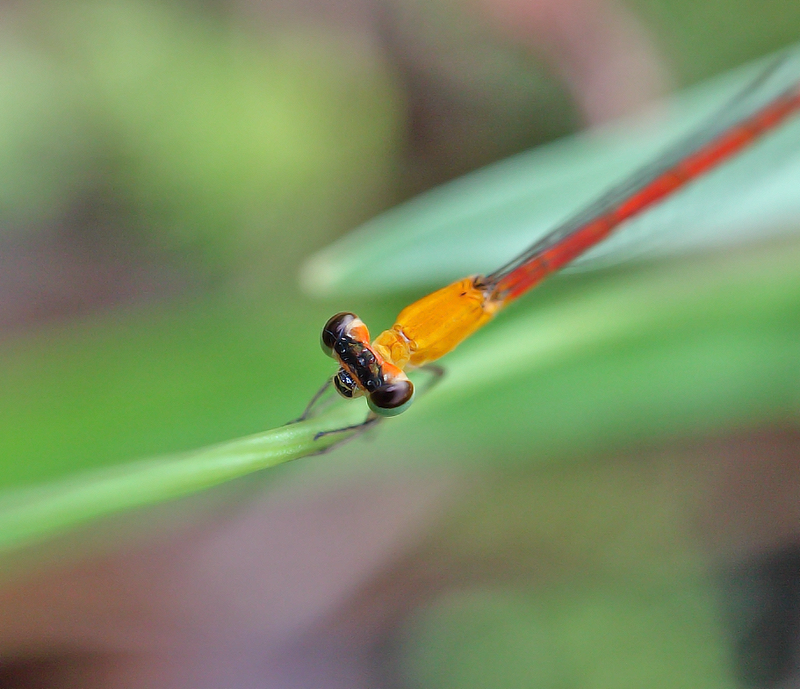 Very young Agriocnemis minima has a totally different colour than the adult female of the same species. It has an orange body and red abdomen. The thorax is totally unmark. 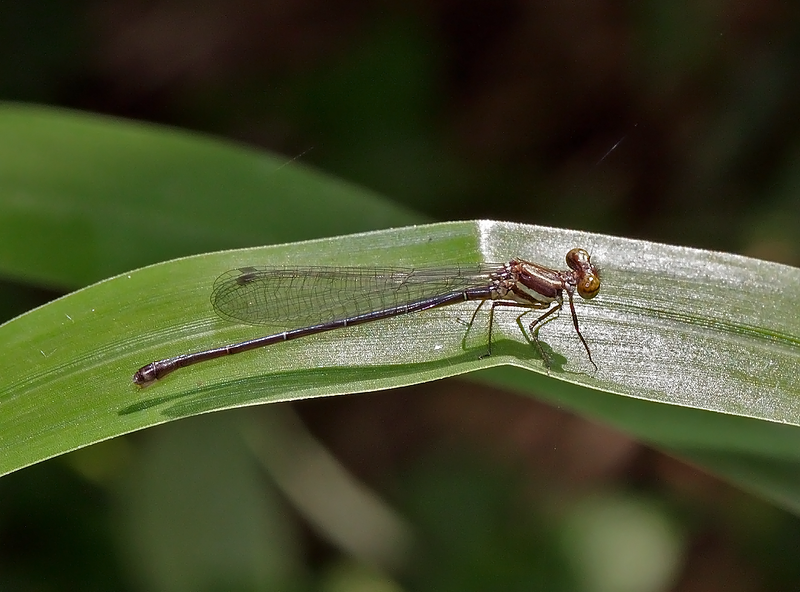 It is a pretty tiny damselfly and was only recently been discovered near the CCNR. 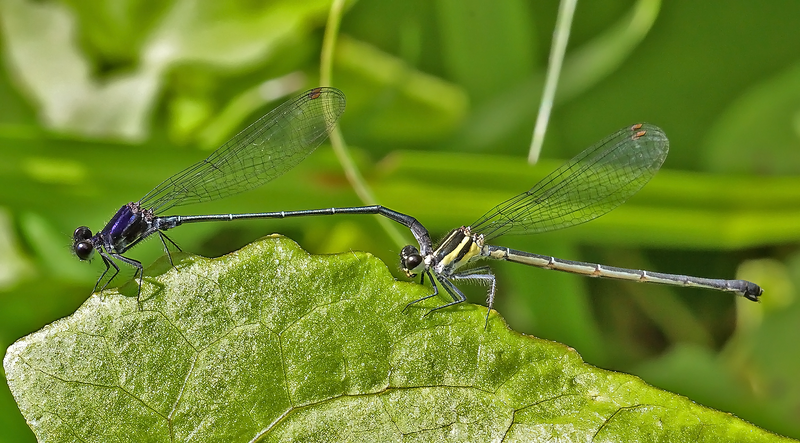 Agriocnemis minima (Selys, 1877) – An encounter with a sub-adult female with a tragic end! As mentioned in my previous posts, I have encountered and taken photos of adult male and various forms of female form from the very young to full adult and the aged. On October 2015, I have come across a very attractive sub-adult female. From the physical appearance, this female is very much the same in size and colour as the full adult female, except that the colour on the thorax is more yellowish and the two stripes at the synthorax are yellow. 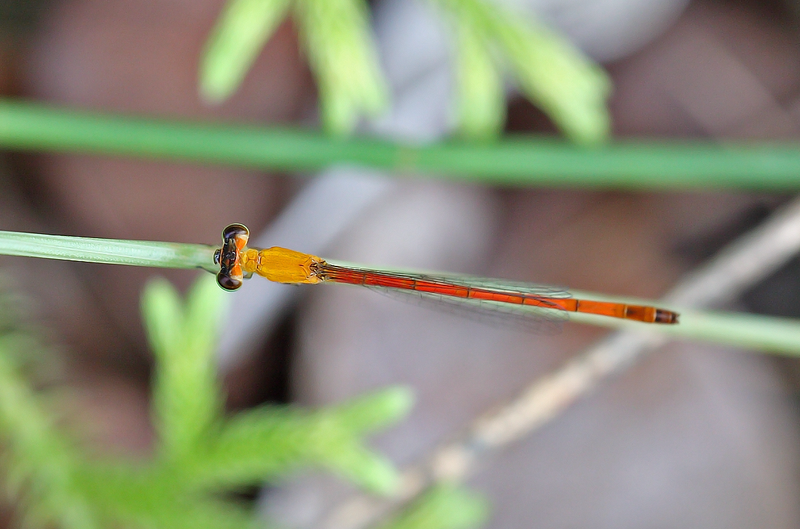 This female individual was found near the edge of the forest’s wetland. 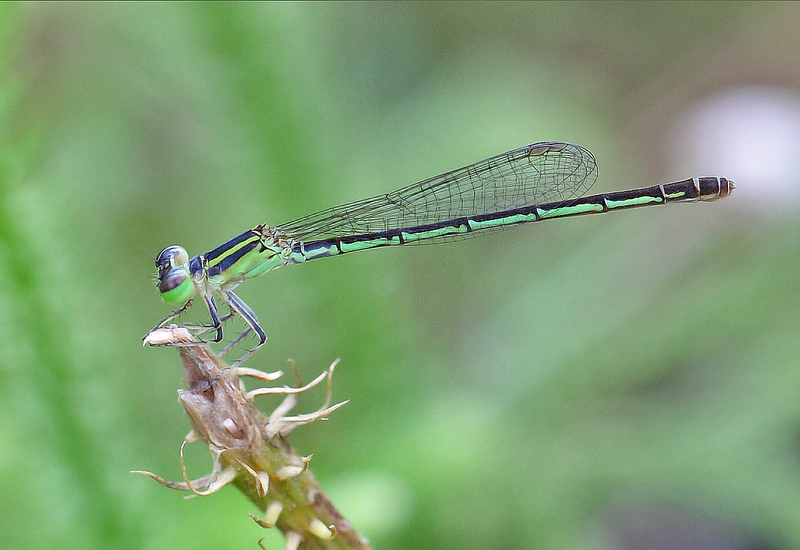 Sadly, this female was preyed by a robber-fly after I had taken most of my shots. The female in dorsal view. Female in lateral view. Notice the two orange-yellowish stripes. A closer dorsal view of the head and thorax. 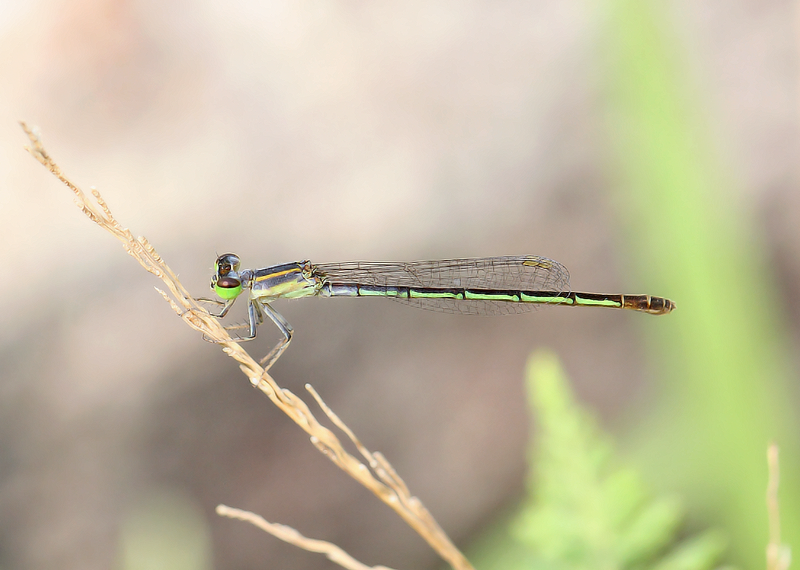 Distinctive green eyes and yellow pterostigmata. Frontal shot of the head. The face is clearly visible. A final lateral view. Yellowish thorax and striking green stripes at the side of the abdomen. This small midget has largely been overlooked by observers as they are so tiny. It is hope that they will permanently make this patch of wetland their home. 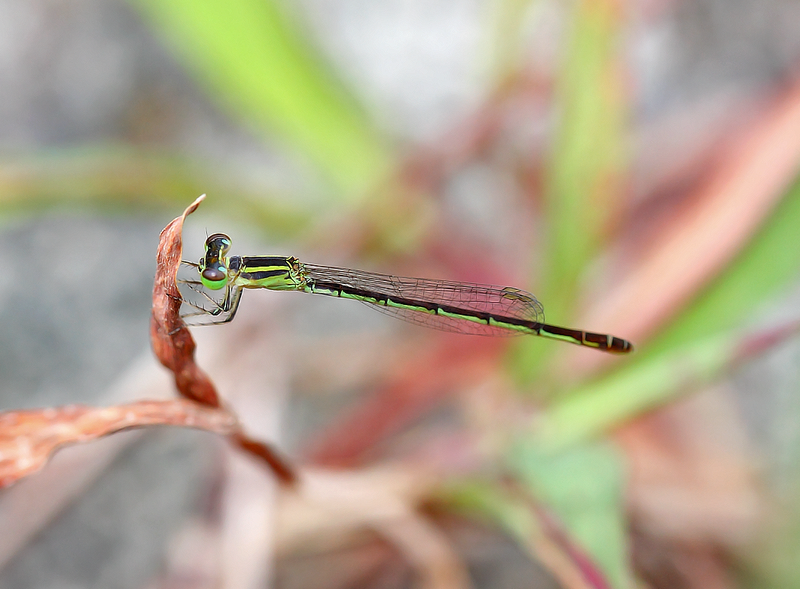 Agriocnemis minima is a tiny and unrecorded species of damselfly that is only recently being discovered in Singapore. 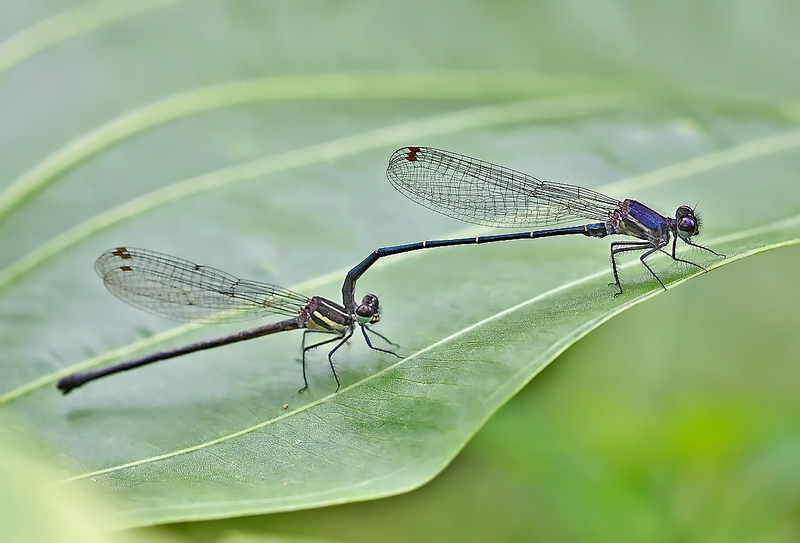 I have taken shots of males and young and aged females at a freshwater swamp in the Western part of Singapore. The adult female has eluded me until very recently when I bumped into this female. After doing some research on the internet, it became apparent to me that this individual should be the adult female form of this species. It is very rare and I have only seen one individual of this form. The eyes are brown on top and green below. It has yellow pterostigmata, and has yellow stripes on the synthorax. The sides of the thorax and abdomen are green and the dorsal side of the abdomen is black. The eyes are brownish on top, and green below. It has blue postocular spots. Top of synthorax and abdomen are black. it has two yellow-greenish stripes on the synthorax. The sides of the thorax is yellowish-green. Wings are clear with yellow pterostigmata. Another dorsal view of this female. Same female – lateral view. 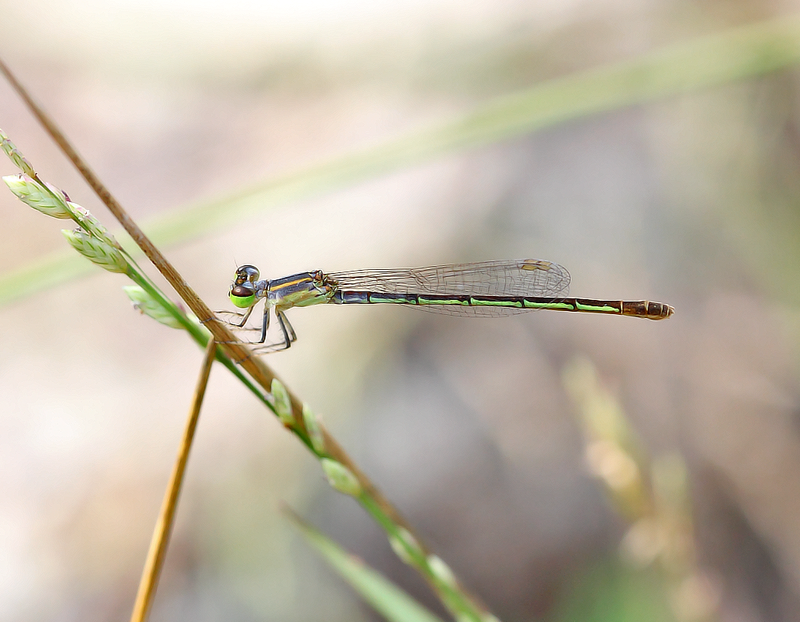 This species prefer to be in the open, grassy areas at the edge of the flooded wetland. 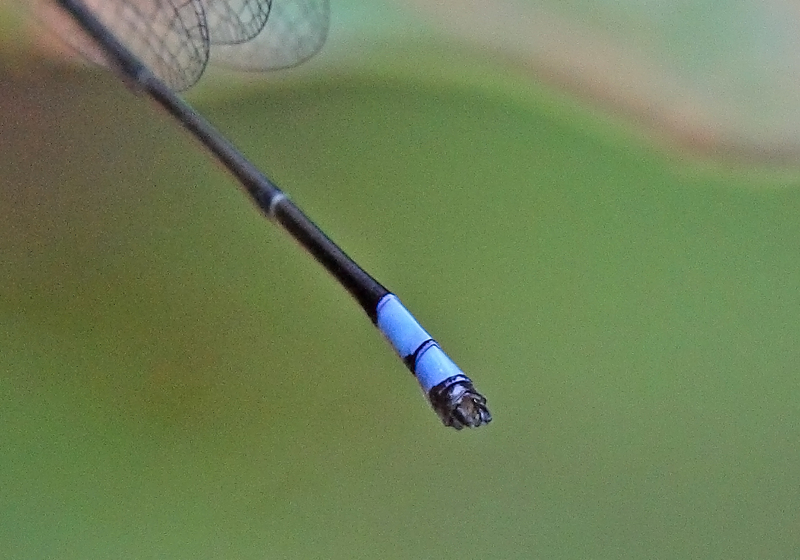 It is probably the tiniest species of damselfly in Singapore with the abdomen plus appendages measuring just 14.5mm. 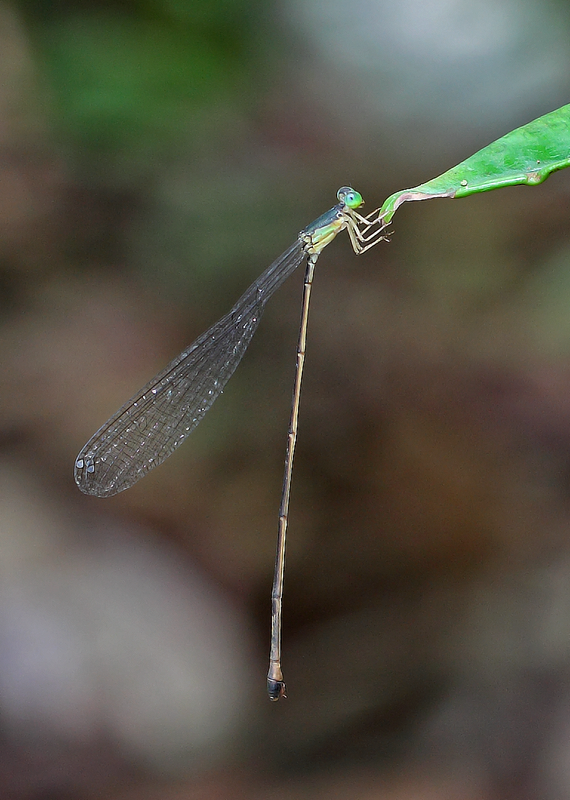 This is a large and distinctive damselfly that lives and breeds in the dense understorey of the Central Catchment Nature Reserve and Bukit Timah Nature Reserve. In fact, it is the largest of it’s family in South-East Asia. In Singapore, it is mentioned that it has been recorded only once or twice a year in the past six years. It is primarily found in very dense vegetation in the forests. It mainly breeds in water-filled tree holes, buttress pans, bamboo stumps. I have personally witnessed this species in the primary and secondary forests in Singapore, such as Upper Pierce Reservoir, Bukit Timah Nature Reserve and Chestnut Avenue forest. This species has very long abdomen. The sides of the thorax is yellowish green, and the dorsum is dark. The eyes are green and the legs are yellow. 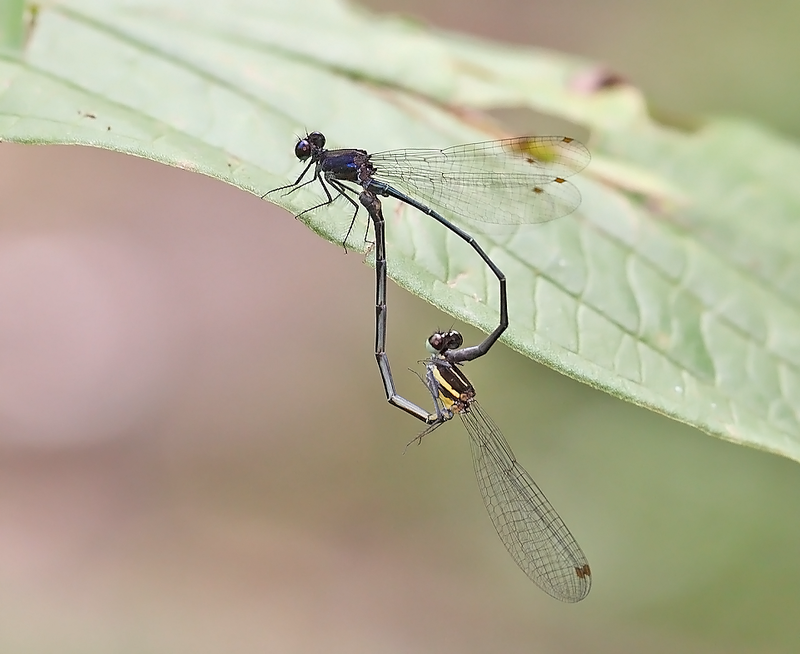 Male has dark brown pterostigma, whilst female has white pterostigma. Female in general is larger and more robust. This species is rare and scarce in Singapore. This large female was found in the Upper Pierce Reservoir forests. I was stunned when I first seen it. She was huge, in the context of the size of an average damselfly. She was flying with a bit of difficulty due to her heavy abdomen. She landed on the tip of a leaf with her abdomen hanging down. A stunning species. It has to be seen to believe! 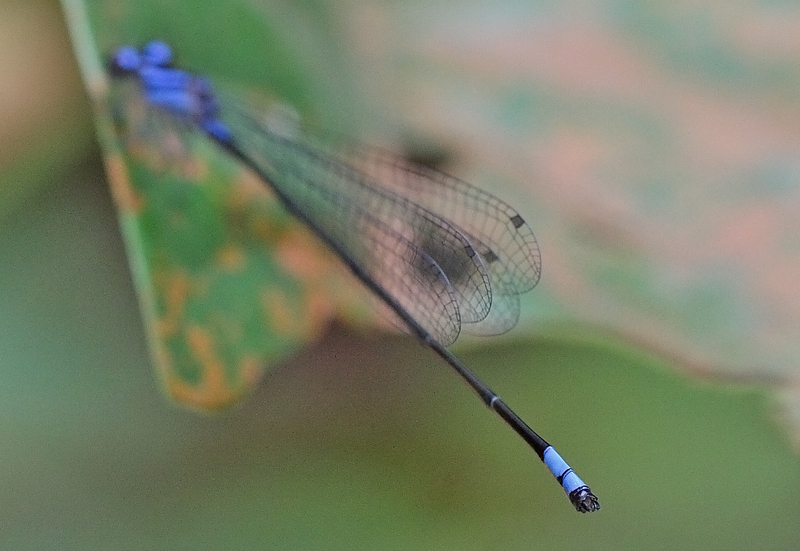 This male was found in the damp, dark, understorey of the forests of Bukit Timah Nature Reserve. This male was found in the Chestnut Avenue forests. There were forest pools and bamboo in the proximity of this individual. This species breeds in this kind of environments. An enlarge shot of the above male.